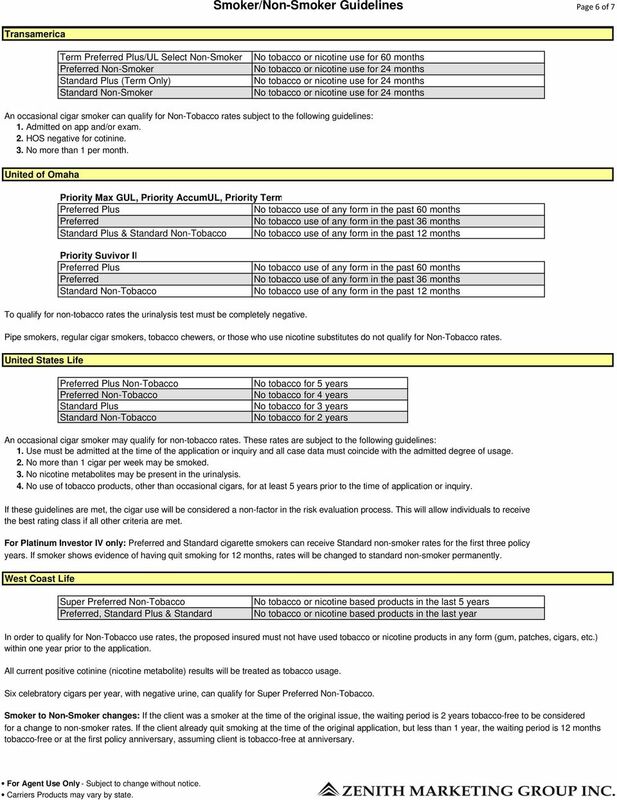 1 Page 1 of 7 American General Plus Non-Tobacco Non-Tobacco Standard Plus No tobacco for 5 years No tobacco for 4 years No tobacco for 3 years No tobacco for 2 years An occasional cigar smoker may qualify for non-tobacco rates. These rates are subject to the following guidelines: 1. Use must be admitted at the time of the application or inquiry and all case data must coincide with the admitted degree of usage. 2. No more than 1 cigar per week may be smoked. 3. No nicotine metabolites may be present in the urinalysis. 4. No use of tobacco products, other than occasional cigars, for at least 5 years prior to the time of application or inquiry. If these guidelines are met, the cigar use will be considered a non-factor in the risk evaluation process. This will allow individuals to receive the best rating class if all other criteria are met. For Platinum Investor IV only: and Standard cigarette smokers can receive Standard non-smoker rates for the first three policy years. If smoker shows evidence of having quit smoking for 12 months, rates will be changed to standard non-smoker permanently. AVIVA Life and Annuity Company of NY Plus (Term & UL) (Term & UL) Standard (Term & UL) No tobacco for 4 years No tobacco for 1 year No tobacco for 1 year Bankers Life will allow the proposed insured who is a limited occasional cigar user to qualify for preferred plus, preferred, and standard non-tobacco rates if ALL conditions below are met:* 1. No more than 2 cigars per month may be smoked. 2. Occasional cigar use must be admitted on the application, including the number and frequency of such use. The LA-23A supplemental questionnaire must be included with term applications upon initial underwriting evaluation. 3. There must be no conflicting nicotine or tobacco use information found on the application, APS, examination, MIB, or inspection. 4. Applicant s urine must test negative for the presence of nicotine. 5. Absolutely no use of other tobacco or nicotine products within the past year. This includes, but is not limited to, cigarettes, pipes, chewing tobacco, snuff, or any nicotine substitutes. 6. Applicant must otherwise qualify for preferred plus, preferred, or standard non-tobacco rates. *The company reserves the right to decline this offer if, in the sole discretion of the underwriter, the occasional cigar use would pose additional mortality risk due to other health conditions of the proposed insured. For Eagle Solution UL only: No Smoker rate, but non-tobacco rates for no use of cigarettes for 1 year. Pipes, cigars, chewing tobacco, nicorette gum and nicotine patch all qualify for non-smokers, even, if medically qualified. AXA Equitable Elite NT (Term) Plus NT (UL) NT (Term) NT (UL) Standard Plus (Term) Standard NT (UL) No tobacco products for 5 years & must test negative for nicotine. No tobacco products for 3 years & must test negative for nicotine. No tobacco products for 3 years & must test negative for nicotine. No tobacco products for 1 years & must test negative for nicotine. No tobacco products for 1 years & must test negative for nicotine. No tobacco products for 1 years & must test negative for nicotine. *An occasional cigar smoker (1 or 2 per month) may qualify for NonSmoker rates provided the client admits to smoking cigars, urine specimen is negative at time of application, and all other underwriting criteria is satisfied. Occasional users of pipes, chewing tobacco, nicotine patches, and nicotine gum are rated as smokers (or tobacco users). 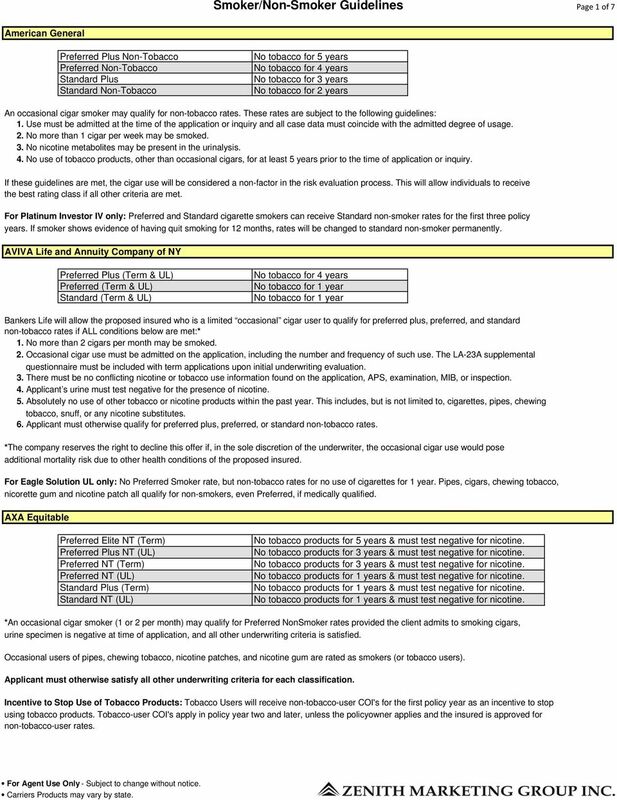 Applicant must otherwise satisfy all other underwriting criteria for each classification. Incentive to Stop Use of Tobacco Products: Tobacco Users will receive non-tobacco-user COI's for the first policy year as an incentive to stop using tobacco products. Tobacco-user COI's apply in policy year two and later, unless the policyowner applies and the insured is approved for non-tobacco-user rates. 2 Page 2 of 7 Banner Life Plus Non-Smoker Standard Plus & Standard Non-Smoker No tobacco or nicotine based products for 36 months* No tobacco or nicotine based products for 24 months* No tobacco or nicotine based products for 12 months* All tobacco users are smokers. *Occasional cigar user (up to 12 per year), with negative urine, may qualify for Plus, or Standard Plus rates. 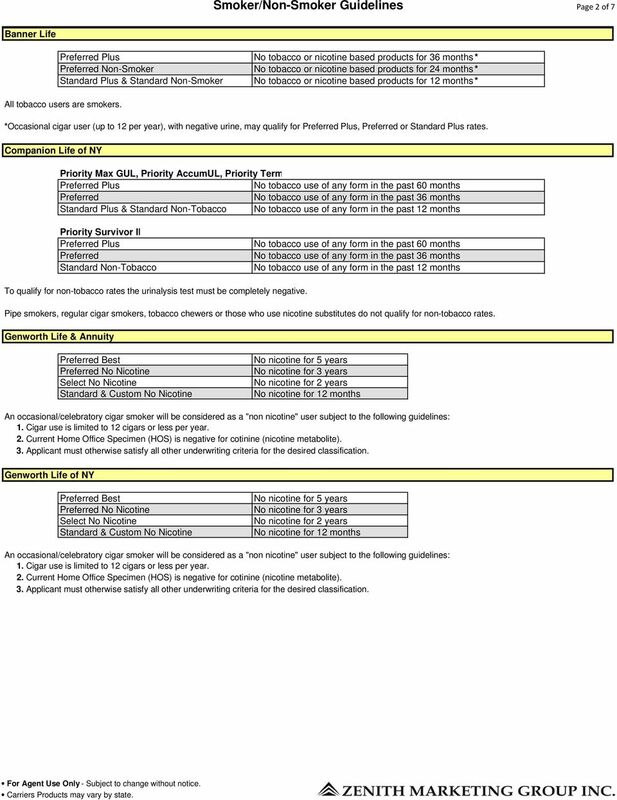 Companion Life of NY Priority Max GUL, Priority AccumUL, Priority Term Plus Standard Plus & No tobacco use of any form in the past 12 months Priority Survivor II Plus No tobacco use of any form in the past 12 months To qualify for non-tobacco rates the urinalysis test must be completely negative. Pipe smokers, regular cigar smokers, tobacco chewers or those who use nicotine substitutes do not qualify for non-tobacco rates. Genworth Life & Annuity Best No Nicotine Select No Nicotine Standard & Custom No Nicotine No nicotine for 5 years No nicotine for 3 years No nicotine for 2 years No nicotine for 12 months An occasional/celebratory cigar smoker will be considered as a "non nicotine" user subject to the following guidelines: 1. Cigar use is limited to 12 cigars or less per year. 2. Current Home Office Specimen (HOS) is negative for cotinine (nicotine metabolite). 3. Applicant must otherwise satisfy all other underwriting criteria for the desired classification. Genworth Life of NY Best No Nicotine Select No Nicotine Standard & Custom No Nicotine No nicotine for 5 years No nicotine for 3 years No nicotine for 2 years No nicotine for 12 months An occasional/celebratory cigar smoker will be considered as a "non nicotine" user subject to the following guidelines: 1. Cigar use is limited to 12 cigars or less per year. 2. Current Home Office Specimen (HOS) is negative for cotinine (nicotine metabolite). 3. Applicant must otherwise satisfy all other underwriting criteria for the desired classification. 3 Page 3 of 7 ING Reliastar Life / ING Reliastar Life of NY Super No Tobacco Select No Tobacco Standard No Tobacco Tobacco No tobacco or nicotine products in any form within past 5 years No tobacco or nicotine products in any form within past 3 years No tobacco or nicotine products in any form within past 2 years No tobacco or nicotine products in any form within past 1 years, does not have a ratable impairment, & does not qualify for No Tobacco An individual who medically qualifies for the class & who has used tobacco or nicotine (less than 2 packs of cigarettes per day) within the past 3 years An occasional celebratory cigar smoker can qualify for Super NT rates subject to the following guidelines: 1. Use must be admitted on the application. 2. Cigar use is limited to no more than 1 cigar per week. 3. The urinalysis must be negative for nicotine/cotinine. *Subject to complete underwriting review. John Hancock / John Hancock (USA) / John Hancock NY Super Non-Smoker Standard Plus Non-Smoker Standard Non-Smoker No tobacco or nicotine use in any form in the last 5 years No tobacco or nicotine use in any form in the last 2 years No tobacco or nicotine use in any form in the last 12 months* No cigarettes in the last 12 months** An occasional celebratory cigar smoker may qualify for Nonsmoker rates subject to the following guidelines: 1. Usage is admitted on the application. 2. Cigar use is limited to no more than 12 cigars per year. 3. No use of other tobacco or nicotine products (in any form) in the last 2 years. 4. Microurinalysis is free of nicotine or its metabolites. *An occasional cigar smoker may qualify for Standard Plus Nonsmoker of he/she smokes no more than 2 cigars/month and microurinalysis is free of nicotine. **Standard Nonsmoker classification also includes individuals who use pipes, cigars, chewing tobacco, nicotine gums, or nicotine patches AND who have not smoked cigarettes in the last 12 months even though the HOS is positive for cotinine as long as the use is admitted on the application. Quit Smoking Incentive (available for all JH USA fixed UL and variable UL products, excluding term and traditional whole life.) Smokers age receive standard non-smoker cost of insurance rates for the first 3 years. A policyowner who then quits smoking for at least 12 months and provides a non-smoker declaration (plus a microurinalysis for face amounts over $500,000 on individual products, $1,000,000 on Survivorship UL) will continue to be charged standard non-smoker cost of insurance rates. Should the insured(s) fail to quit smoking, smoker cost of insurance rates will become effective starting in policy year 4 for the life of the insured. A new 7-pay test period starts when a smoker becomes a nonsmoker and is charged non-smoker cost of insurance charges. Lincoln Benefit Life Elite Standard Select Standard No-Tobacco Smoker No use of tobacco products or nicotine substitutes for at least the past 5 years & urinalysis negative for nicotine No use of tobacco products or nicotine substitutes for at least the past 3 years & urinalysis negative for nicotine No use of all tobacco products or nicotine substitutes for at least the past 2 years & urinalysis negative for nicotine No use of all tobacco products or nicotine substitutes for at least the past 12 months & urinalysis negative for nicotine Current cigarette use within the last 12 months must be limited & not exceed 1 pack (20) of cigarettes daily. 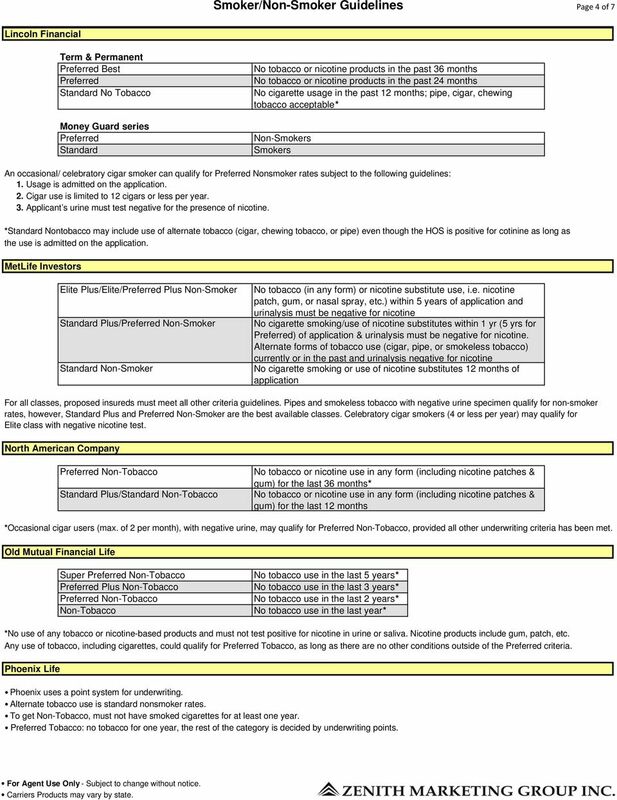 The proposed insured must satisfy all other preferred criteria An occasional/ celebratory cigar smoker can qualify for Standard Nonsmoker rates subject to the following guidelines: 1. Usage is admitted on the application. 2. No more than one cigar per month. 3. Applicant s urine must test negative for the presence of nicotine. 4. Applicant can t have tested positive w/ another company for the time period required to be tobacco free for the requested rate class. 5. Can t be using any other form of nicotine substitute like the patch, gum, etc. 4 Page 4 of 7 Lincoln Financial Term & Permanent Best Standard No Tobacco Money Guard series Standard No tobacco or nicotine products in the past 36 months No tobacco or nicotine products in the past 24 months No cigarette usage in the past 12 months; pipe, cigar, chewing tobacco acceptable* Non-Smokers Smokers An occasional/ celebratory cigar smoker can qualify for Nonsmoker rates subject to the following guidelines: 1. Usage is admitted on the application. 2. Cigar use is limited to 12 cigars or less per year. 3. Applicant s urine must test negative for the presence of nicotine. *Standard Nontobacco may include use of alternate tobacco (cigar, chewing tobacco, or pipe) even though the HOS is positive for cotinine as long as the use is admitted on the application. MetLife Investors Elite Plus/Elite/ Plus Non-Smoker Standard Plus/ Non-Smoker Standard Non-Smoker No tobacco (in any form) or nicotine substitute use, i.e. nicotine patch, gum, or nasal spray, etc.) 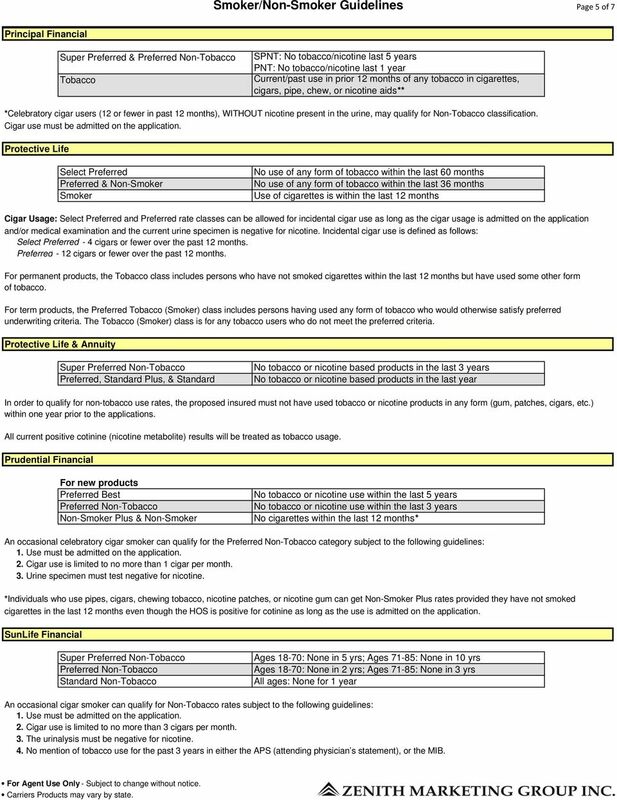 within 5 years of application and urinalysis must be negative for nicotine No cigarette smoking/use of nicotine substitutes within 1 yr (5 yrs for ) of application & urinalysis must be negative for nicotine. Alternate forms of tobacco use (cigar, pipe, or smokeless tobacco) currently or in the past and urinalysis negative for nicotine No cigarette smoking or use of nicotine substitutes 12 months of application For all classes, proposed insureds must meet all other criteria guidelines. Pipes and smokeless tobacco with negative urine specimen qualify for non-smoker rates, however, Standard Plus and Non-Smoker are the best available classes. Celebratory cigar smokers (4 or less per year) may qualify for Elite class with negative nicotine test. North American Company Non-Tobacco Standard Plus/ No tobacco or nicotine use in any form (including nicotine patches & gum) for the last 36 months* No tobacco or nicotine use in any form (including nicotine patches & gum) for the last 12 months *Occasional cigar users (max. of 2 per month), with negative urine, may qualify for Non-Tobacco, provided all other underwriting criteria has been met. Old Mutual Financial Life Super Non-Tobacco Plus Non-Tobacco Non-Tobacco Non-Tobacco No tobacco use in the last 5 years* No tobacco use in the last 3 years* No tobacco use in the last 2 years* No tobacco use in the last year* *No use of any tobacco or nicotine-based products and must not test positive for nicotine in urine or saliva. Nicotine products include gum, patch, etc. Any use of tobacco, including cigarettes, could qualify for Tobacco, as long as there are no other conditions outside of the criteria. Phoenix Life Phoenix uses a point system for underwriting. Alternate tobacco use is standard nonsmoker rates. To get Non-Tobacco, must not have smoked cigarettes for at least one year. Tobacco: no tobacco for one year, the rest of the category is decided by underwriting points. 5 Page 5 of 7 Principal Financial Super & Non-Tobacco Tobacco SPNT: No tobacco/nicotine last 5 years PNT: No tobacco/nicotine last 1 year Current/past use in prior 12 months of any tobacco in cigarettes, cigars, pipe, chew, or nicotine aids** *Celebratory cigar users (12 or fewer in past 12 months), WITHOUT nicotine present in the urine, may qualify for Non-Tobacco classification. Cigar use must be admitted on the application. Protective Life Select & Non-Smoker Smoker No use of any form of tobacco within the last 60 months No use of any form of tobacco within the last 36 months Use of cigarettes is within the last 12 months Cigar Usage: Select and rate classes can be allowed for incidental cigar use as long as the cigar usage is admitted on the application and/or medical examination and the current urine specimen is negative for nicotine. Incidental cigar use is defined as follows: Select - 4 cigars or fewer over the past 12 months cigars or fewer over the past 12 months. For permanent products, the Tobacco class includes persons who have not smoked cigarettes within the last 12 months but have used some other form of tobacco. For term products, the Tobacco (Smoker) class includes persons having used any form of tobacco who would otherwise satisfy preferred underwriting criteria. The Tobacco (Smoker) class is for any tobacco users who do not meet the preferred criteria. Protective Life & Annuity Super Non-Tobacco, Standard Plus, & Standard No tobacco or nicotine based products in the last 3 years No tobacco or nicotine based products in the last year In order to qualify for non-tobacco use rates, the proposed insured must not have used tobacco or nicotine products in any form (gum, patches, cigars, etc.) within one year prior to the applications. All current positive cotinine (nicotine metabolite) results will be treated as tobacco usage. Prudential Financial For new products Best Non-Tobacco Non-Smoker Plus & Non-Smoker No tobacco or nicotine use within the last 5 years No tobacco or nicotine use within the last 3 years No cigarettes within the last 12 months* An occasional celebratory cigar smoker can qualify for the Non-Tobacco category subject to the following guidelines: 1. Use must be admitted on the application. 2. Cigar use is limited to no more than 1 cigar per month. 3. Urine specimen must test negative for nicotine. *Individuals who use pipes, cigars, chewing tobacco, nicotine patches, or nicotine gum can get Non-Smoker Plus rates provided they have not smoked cigarettes in the last 12 months even though the HOS is positive for cotinine as long as the use is admitted on the application. 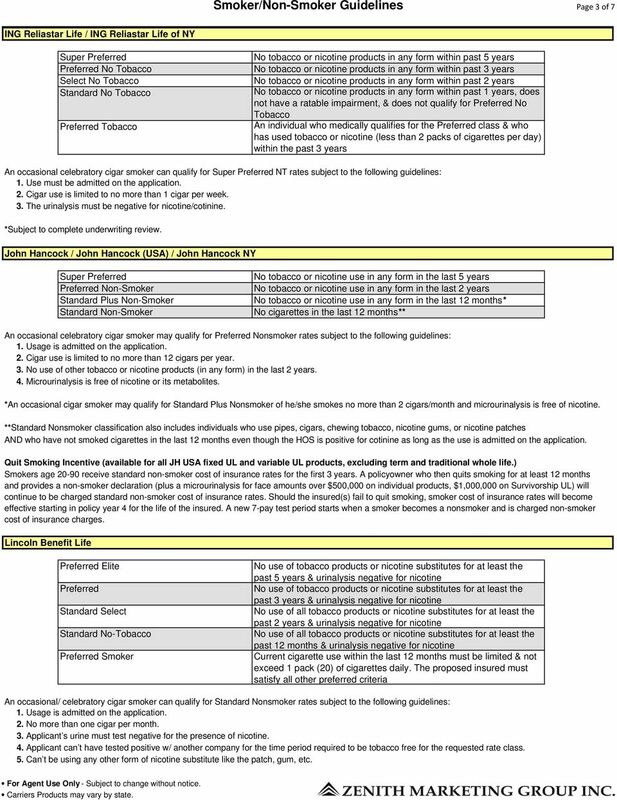 SunLife Financial Super Non-Tobacco Non-Tobacco Ages 18-70: None in 5 yrs; Ages 71-85: None in 10 yrs Ages 18-70: None in 2 yrs; Ages 71-85: None in 3 yrs All ages: None for 1 year An occasional cigar smoker can qualify for Non-Tobacco rates subject to the following guidelines: 1. Use must be admitted on the application. 2. Cigar use is limited to no more than 3 cigars per month. 3. The urinalysis must be negative for nicotine. 4. No mention of tobacco use for the past 3 years in either the APS (attending physician s statement), or the MIB. 6 Page 6 of 7 Transamerica Term Plus/UL Select Non-Smoker Non-Smoker Standard Plus (Term Only) Standard Non-Smoker No tobacco or nicotine use for 60 months No tobacco or nicotine use for 24 months No tobacco or nicotine use for 24 months No tobacco or nicotine use for 24 months An occasional cigar smoker can qualify for Non-Tobacco rates subject to the following guidelines: 1. Admitted on app and/or exam. 2. HOS negative for cotinine. 3. No more than 1 per month. United of Omaha Priority Max GUL, Priority AccumUL, Priority Term Plus Standard Plus & No tobacco use of any form in the past 12 months Priority Suvivor II Plus No tobacco use of any form in the past 12 months To qualify for non-tobacco rates the urinalysis test must be completely negative. Pipe smokers, regular cigar smokers, tobacco chewers, or those who use nicotine substitutes do not qualify for Non-Tobacco rates. United States Life Plus Non-Tobacco Non-Tobacco Standard Plus No tobacco for 5 years No tobacco for 4 years No tobacco for 3 years No tobacco for 2 years An occasional cigar smoker may qualify for non-tobacco rates. These rates are subject to the following guidelines: 1. Use must be admitted at the time of the application or inquiry and all case data must coincide with the admitted degree of usage. 2. No more than 1 cigar per week may be smoked. 3. No nicotine metabolites may be present in the urinalysis. 4. No use of tobacco products, other than occasional cigars, for at least 5 years prior to the time of application or inquiry. If these guidelines are met, the cigar use will be considered a non-factor in the risk evaluation process. This will allow individuals to receive the best rating class if all other criteria are met. For Platinum Investor IV only: and Standard cigarette smokers can receive Standard non-smoker rates for the first three policy years. If smoker shows evidence of having quit smoking for 12 months, rates will be changed to standard non-smoker permanently. West Coast Life Super Non-Tobacco, Standard Plus & Standard No tobacco or nicotine based products in the last 5 years No tobacco or nicotine based products in the last year In order to qualify for Non-Tobacco use rates, the proposed insured must not have used tobacco or nicotine products in any form (gum, patches, cigars, etc.) within one year prior to the application. All current positive cotinine (nicotine metabolite) results will be treated as tobacco usage. Six celebratory cigars per year, with negative urine, can qualify for Super Non-Tobacco. Smoker to Non-Smoker changes: If the client was a smoker at the time of the original issue, the waiting period is 2 years tobacco-free to be considered for a change to non-smoker rates. If the client already quit smoking at the time of the original application, but less than 1 year, the waiting period is 12 months tobacco-free or at the first policy anniversary, assuming client is tobacco-free at anniversary. 7 Page 7 of 7 William Penn Life Plus Non-Smoker Standard Plus & Standard Non-Smoker No tobacco or nicotine based products for 36 months* No tobacco or nicotine based products for 24 months* No tobacco or nicotine based products for 12 months* *Occasional cigar user (up to 12 per year), with negative urine, may qualify for Plus, or Standard Plus rates. Please check with an underwriter for Nicorette gum use. VOLUME ONE - 2015. Always providing you a choice of options...where the path becomes apparent. Universal Life Product Guide. every life has a story. Updated march 26, 2012. Give yourself an edge in the business insurance market. FOR INSURANCE ADVISOR USE ONLY. NOT INTENDED FOR CLIENT DISTRIBUTION. Term 10 and Term 20 Guaranteed renewable and convertible Insurance Advisor Guide Many people day work hard at leading a healthy lifestyle.